There are times I think I will never have a photo taken of me -whilst wearing my running kit- where I look warm and dry. I know it's a curse of living in a temperate rainforest, but there are times, when I look at the rain and the cold and think, "Not again"
Today, was a good day for the ducks. It was cool (about 45F or 7-8C) and absolutely pouring with rain. It was also in some parts of Stanley Park a bit windy. Running into the torrential rain blasting in your face is an excellent way to look like a drowned rat in photo's. However, this didn't stop Craig, Simon and myself meeting up again for a Barefoot/Minimalist run around the seawall. It was fantastic to see Simon and Craig again; the fun chemistry was still there and we all reveled in the fact we were all a lot fitter than the last time we met up. Craig pulled out his Garmin, (I know technology, who would have thought it?) and we settled on a 9-9:30 pace for the 10K+. Craig likes his wrist-watches apparently and as I am not used to running with technology, I thought it was funny every time Craigs' watch beeped at us trying to tell us to slow down. It seemed that we were always too quick when Craig checked and despite our best efforts we didn't want to slow down. In the end we managed a 9:15 pace, (even with two stop-offs) and we ran 7.2 miles. Now if the Garmin could order my post-run coffee I might get into this technology lark. Simon and I decided to wimp it out by putting on some minimalist shoes initially; Simon in his KSO's and me in my hacked water boots. Craig is the hard-arse in our group and was running barefoot AGAIN. Honestly, this guy is our barefoot guru. He has been running barefoot for 10 years, has run 4 Marathons and countless other half-marathons in such varying temps that today he wasn't dampened by the cold, wind and torrential rain. In fact he thought it would be fun to run balanced of the edge of the seawall. I tried, but my slick hacked water boots sent me over the edge (luckily onto a sandy-beach). I must remember that no grip on a wet, uneven, granite slab wall leads to doom, disaster and potentially a little bit of death. Last time we ran, Simon and I had to stop a couple of times to catch our breath whilst Craig patiently waited. We still had to stop a couple of times today, but that wasn't due to the extra Christmas poundage we had, but due to an emergency toilet break and for Simon and I to take off our shoes for the last kilometre. Yep, our tootsies hit the bare ground. It was good to see our form wasn't that bad from the winter in minimal shoes. No blisters here thank you very much (a big change from last time). It was great for all three of us to enter the community centre barefoot together and the good company meant that I hadn't really thought about the running clinic I had organised for after the run. The running clinic was set-up after I had emails from new minimalist runners who wanted to learn about good form. This was never something I had thought of doing, but when more and more people ask, there has to be a certain point where you have to put yourself out there. As most people were based in downtown, I thought it would be good to organise the clinic for after our BRS meet-up. A lot of the new runners didn't want to run 10K (which is good, "Too much Too soon"), so an "after-clinic" seemed a better idea. However, after looking at the weather forecast all week and seeing the rain this morning first hand, I was not expecting anyone to turn up. I mean, who would want to take their shoes off and run in the cold rain? Oh, yeah, us.. but we're freaks. Craig, Simon and I don't count. So it was a surprise when three people turned up to the clinic. Kyle, Scott and Barbara all turned up just as Simon and Craig went to get changed into dry clothes -even they weren't expecting anyone. So it was left to me to try and show good form and when Craig and Simon came back, we all tried to give advice as best we could. I am not sure how well the clinic went. I hadn't exactly prepared; procrastination is my first, middle and last name; so it was more of a jumble of idea's and comments. I am hoping Kyle, Scott and Barbara all took something away from the clinic. I promise to be more orgnaised and structured next time. Hopefully the weather will be better too. Learning form when your feet are freezing is not a good start. We all went and had second breakfast together and it was nice to again see how diverse we all are. In our little group we had a lawyer, bio-chemist, software engineer, electrical engineer, a trader/broker and me (middle aged mother of a smart-arsed kid). We laughed, joked and made plans for a mini meet-up at the Sun-run, maybe IBRD/Vancouver Marathon and a big BRS meet-up later next month. 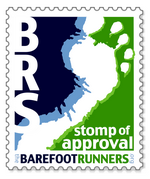 I am always amazed how well fellow Barefoot runners all get on and how easy it was to talk to everyone. I hope our new friends found that too and decide to come and meet-up again. You guys are awesome! It's great that you have a group to run with. And I wish I could visit one of your clinics. That is great! Just like Jen said.. awesome to have a group to run with!